Ben started his journey into photography back when everything was done using film and chemicals. He enjoyed producing B&W images and color Cibachrome prints in the darkroom. Back then, he shot using both handheld 35mm SLR cameras as well as working under the dark cloth of a 4×5 view camera. His passion for photography really took hold when he started incorporating light painting and studio strobes into his photography in the 1980’s. During college, Ben also explored other visual arts, including hot glass work (neon bending, sand casting, lost wax process and glass blowing) before discovering his second passion in graphic design. While in school, Ben worked as a graphic designer for his school newspaper (the MN Daily) where he learned how to produce advertising and editorial content for the paper using X-acto knives, border tape, blue-lined paper, wax and a stat camera. Ben has always had a passion for technology and would spend much of his free time during high school in the school’s computer room typing away on their terminals which output green and white striped paper and communicated with a mainframe via a telephone coupler. He has worked with all sorts of computers from the TRS-80, Vic 20, Commodore 64, Commodore 128, Osborn 1, Apple ][ and Apple /// as well as typesettings systems such as Hastek and Ad Pro. 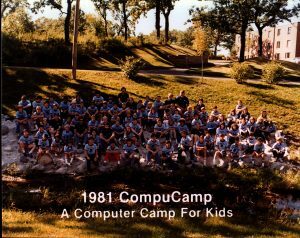 He even attended Compu-Camp at Bethel college back in 1981 where he used a graphics tablet for the first time. In 1984 Ben purchased a 128K Macintosh and hasn’t turned back since. Before leaving college, he helped transition his college newspaper to digital production techniques. He has worked with software such as ReadySetGo, Pagemaker, InDesign, QuarkXPress, Illustrator, Freehand, Multi-Ad Creator and many more. Ben started to combine his three passions before leaving college when he launched his own multi-state newspaper called the Midwest States Collector which was distributed in MN, WI, ND and SD. He received financial backing from a partner in Colorado who arranged the purchase of editorial content from a sister publication in his area and hired a local advertising sales rep. Ben’s job was to do everything else. That included design, layout, advertising production and prepress all from his parents’ home. 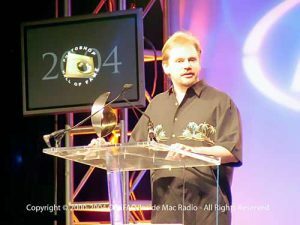 Ben accepting Photoshop Hall of Fame award in 2004. 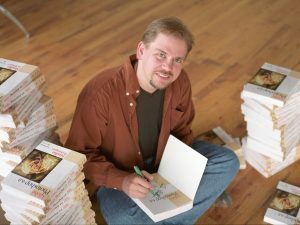 After college, Ben worked as a typesetter, graphic designer and production person at various magazines, newspapers, design firms and small businesses around the Twin Cities. Sometime in the early 90’s he attended a seminar on a new program he’d been using called Photoshop. He left the event feeling very unsatisfied and thinking that he could do a much better job of teaching people how to use the program. That day, he decided to quit his full-time job and start producing his own Photoshop seminars. His first seminar was in Minneapolis in 1994 and had 63 people in attendance. It was the first time Ben had ever spoken to a group of any kind and everyone left satisfied. Over the last two decades, he has personally taught well over 100,000 people in person on all seven continents. He regularly speaks at conferences (including over 30 appearances at PhotoshopWorld), trade-shows and photo festivals worldwide. Ben signing books soon after Photoshop 6 was released. Someone from Adobe was in the audience when Ben spoke at his first conference (the Thunder Lizard Productions Photoshop Conference). Being impressed with his teaching technique, they asked if Ben would be interested in writing a book for Adobe Press. At the time of its release, Photoshop Studio Techniques was the only Photoshop book on the market that included the “official” badge from Adobe. That book went on to become a standard textbook in many college Photoshop classes and became an award-winning, best-seller. Ben has since written over a dozen books on digital imaging that have been translated into well over a dozen languages. Ben retired from writing books in 2008 to concentrate on video-based educational projects. Over the last two decades, he has toured the country presenting seminars for KelbyOne. In 2012 he made his first appearance on CreativeLIVE.com and has since taught well over 30 classes to audiences of as large as 20,000. 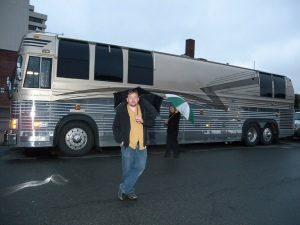 On March 17th, 2006 Ben decided to sell the majority of his belongings and start living life on the road aboard a 40′ motorcoach. Since then, he has explored all 50 states in the USA. He has since sold his first bus and is currently preparing to transition into living aboard a vintage 34′ 1963 Flxible Starliner motorcoach and continue his journey with his wife Karen. Ben with his first home on wheels. He lived on this one for almost 8 years. Ben enjoys photographing vintage Americana, specializes in light painting and spends at least two months a year exploring outside of the USA. During those travels, he likes to capture photographs of his wife doing yoga in exotic locations worldwide. In the next year or so, he hopes to complete circumnavigations of the earth by both sea and air. He has led photographic workshops to locations such as Iceland, Africa, Laos, Cambodia, Thailand, and the Galapagos Islands and has explored more than 40 countries.